7:53 pm, 26 August, 2009 р. 9:13 pm, 26 August, 2009 р. Did you uncheck “Fit to page” and “Use model extents”? 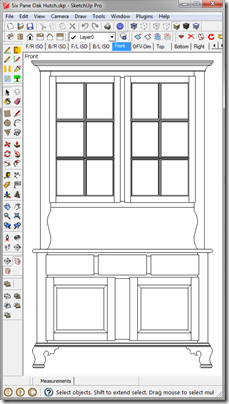 Did you shrink down the white space in the SketchUp window so that there was minimal space on either side of your cube. 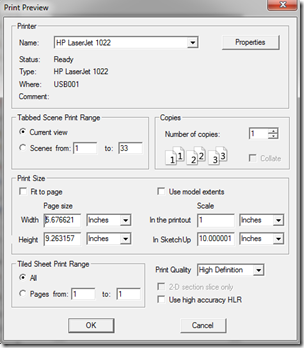 And is your printer margins set to something like 0.5″ or less? If you are still having problems send me your .skp file and I will look at it to see what the problem is. My email address is jpz@srww.com . 8:39 am, 11 November, 2009 р.
I tried everything (I thought) prior to reading your blog and searched sketchup help could not find how to print model parts. Your blog is thorough and clear and I was then able to figure out how to print on various size papers more easily. Thank-you for taking the time to write this , it was very helpful and well writen. 9:37 am, 11 November, 2009 р. Thanks for the kind words. Actually it is on my to do list to update it for SketchUp 7. If you have any suggestions please pass them along. Thanks again. 2:08 pm, 26 February, 2010 р. You are awesome…this is certainly a glitch, window size should not have to be altered to print a scaled drawing. Thank you thank you thank you. 2:40 pm, 26 February, 2010 р. You are welcome. It is clearly a design flaw and it has been in SketchUp for some time. Don’t know why they haven’t fixed it yet. 4:21 am, 7 March, 2011 р. Thanks, it was really helpfull ! 11:05 am, 7 March, 2011 р. 10:37 am, 25 March, 2011 р. 11:09 am, 25 March, 2011 р. 1:57 pm, 9 April, 2011 р. What is the best way to print out a dimensioned drawing of each component? For example, I have a leg component that it used four times in the drawing. They are all on the same layer. When I open that layer, I have all four copies. I only want to print out one copy to use in the shop. 2:46 pm, 9 April, 2011 р.
I assume you are trying to print out one leg with its dimensions. What I usually do in a situation like that is create a Z-Leg layer (using the Add Invisible Layer tool). From the In House components library fetch a leg and put it on the Z-Leg layer (you will have to select it and place it on that layer in the Entity Info box). Now dimension it. 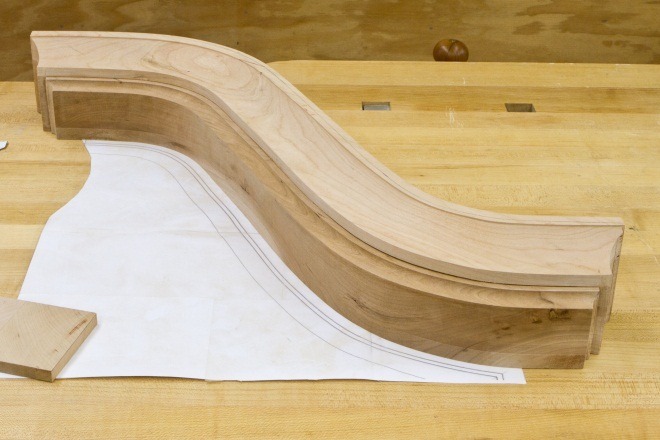 When you are done select all the dimensions and place them on the Z-Leg layer. Create a scene with only Layer0 and Z-Leg visible. Then print that scene. 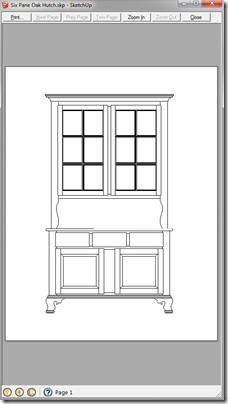 Go to my Free Plans page and download my Trundle Bed SketchUp model and look at how I did this for the bed posts, panels and swan necks. If you are still having problems send me a copy of your .skp file attached to an email address to jpz@srww.com. I will do the above operations for you and send it back. 5:43 pm, 11 April, 2011 р.
that discusses how to fill in the four boxes. 7:10 pm, 11 April, 2011 р. Are you trying to print a full scale template? Don’t put anything in the Width and Height boxes. Those boxes are for the size of the paper you want to use. First un-check both the “Fit to page” and “Use model extents” check boxes. 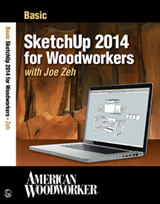 Put 1″ in both “In the print out” and “In SketchUp” boxes. Now, read what the Width and Height boxes and their units say. That is telling you the size of a sheet of paper you need to get everything on one page. Often, depending on the size of your component, it is bigger than one sheet of paper your printer is capable of handling. In that case just instruct SketchUp to print the multiple pages. 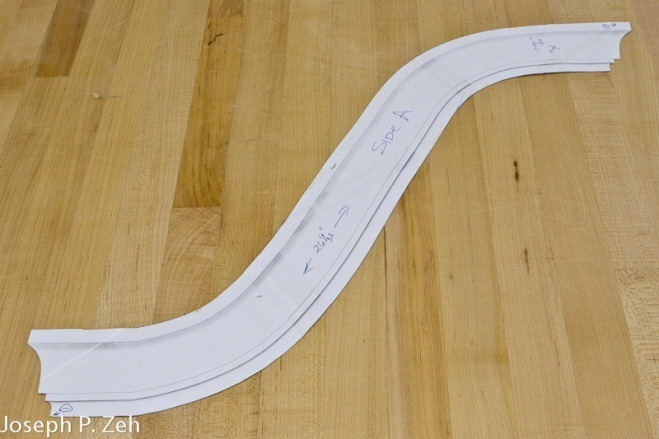 Cut and tape them together to get a full size template. If the numbers and their units in the Width and Height are equal to or less than the size paper you have in your printer you are in luck. Just instruct SketchUp to print and your component will be on one page and full size. Don’t forget, SketchUp has to account for the minimum margins your printer requires. So don’t expect a component whose dimensions are 10 7/8″ by 8 3/8″ to fit on an 11″ by 8 1/2″ sheet. If you are still having problems contact me at jpz@srww.com and attach your .skp file to the email. I will try to print it out myself and tell you what I did. Now, it is possible the MAC version of SketchUp has different printing dialog boxes, in which case I can’t help you. I don’t have access to a MAC. But I may be able to locate someone who uses SketchUp on a MAC. 2:10 am, 2 September, 2011 р. Can you please tell me if there is a way that I can get a realistic glass texture other than the standard colours that come with SU? I have seen others around that look much more proffesional but I think they are done on another software like vray or similar. 7:04 am, 2 September, 2011 р.
I have not come across or used glass textures. You might want to look in the Google SketchUp 3D Warehouse. Making one seems more of a Photoshop effort than a SketchUp one. I imagine it as simply a semi-transparent jpeg with the appropriate textures. In fact, you might want to Google glass textures and Photoshop too. 11:07 pm, 25 July, 2012 р.
I came across your site while looking for answers on how to print to scale. So far your guidance has been helpful and appriciated. I, however, am still having a problem in one area. You say to “Minimize window area or maximize zoom”. 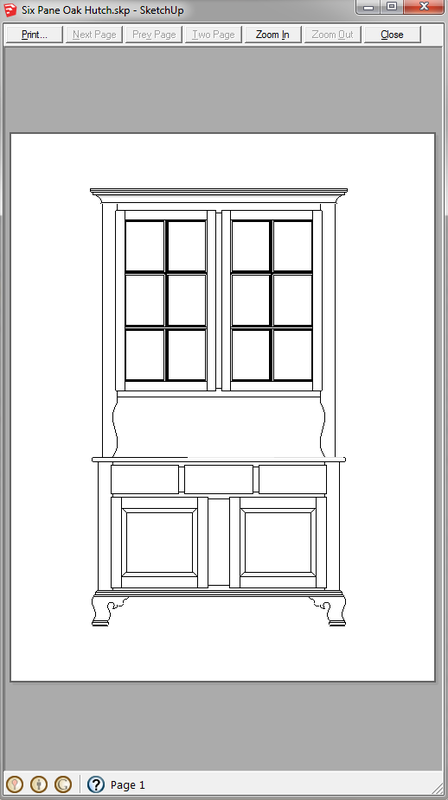 How do you minimize the window area. 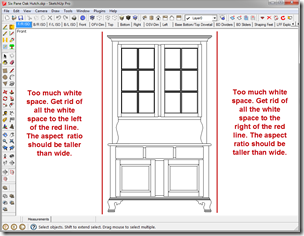 On some screen shots I have seen a small triangle at the extream lower right of the sketchup screen, to the right of the measurements box. I however do not see that feature on my screen. I am using the free version of sketchup 8 on a PC running windows 7. While I can get the object scaled to the desired size it does not orient itself on the paper and speards over 2 to 4 pages witha bit of the object on each page. The only way I have had any luck getting it to print on one page is to psh the object to the extreame upper left of the shetchup screen using the “pan’ tool. I an sure there is a better way but I have been trying to find it for days with no success. I hope you can help. 6:21 am, 26 July, 2012 р. First let me say that while I love SketchUp, and use it exclusively for drawing my furniture, the printing to scale feature has a software bug that has been in it since day 1 and each new release comes out and the bug is still there. have written several bug reports on this but it never seems to get high enough on the priority list to get fixed. That rant said, you can make it work as I have instructed in this post. Let me clarify. When I say “Minimize window area or maximize zoom” I am not referring to any one tool icon or command, but rather instructing you to do whatever you need to do to minimize any white area around the object you want printed to scale. So Zoom, Pan, Zoom Extents or even grabbing the sides of the applications window and dragging to make the window smaller are all techniques to reduce the amount of white space around the desired object. Sometimes you have to be so drastic as to drag the edges in and watch your tool icons start to reposition themselves. The trick is to adjust your applications window aspect ratio to be the same as the object you are trying to print and then reduce the amount of white space around it. Ideally you want you object to almost touch the sides of your applications window with just a minor amount of white space. If this doesn’t clarify things and you still can’t print to scale send me your .skp (jpz@srww.com) file and tell me what you want printed and to what scale. I will create a short video for you demonstrating how to do it. I have never come across a case where I can’t print to scale, but it does take some trial and error. 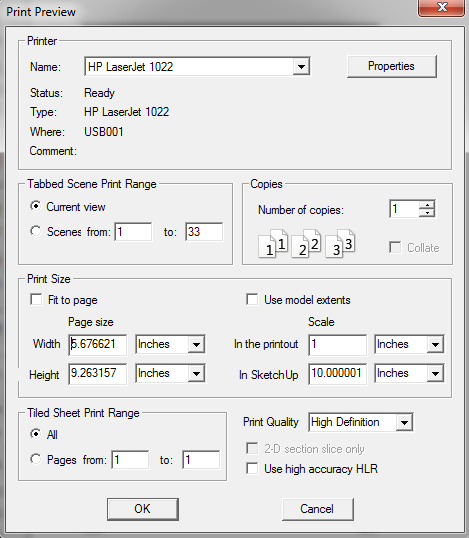 8:45 am, 30 August, 2012 р.
i am trying to print a full scale printout of a chair. My plan is to take the file to kinkos and use their big printer. any suggestions? do i need a pdf file? can you please elaborate on the appropriate steps? 9:57 am, 30 August, 2012 р.
I think your biggest problem is going to be whether or not Kinkos has the SketchUp application installed and if they do it likely needs to be the Pro version. I don’t believe the Free version will handle the page size you need (I can’t check for you right now because I have only the Pro version on my machine and not the Free version). If Kinkos has the Pro you can go to the File/Print Setup/Properties button and finally Custom button to set up the page size. Once you have done this, printing to scale is then same as described in this post. Remember, the trick of printing to scale is to have your model fill the screen with very little to no dead space around it. That means playing with the screen size until the window has the same aspect ratio as the bounding box of your model and then using the thumb wheel on the mouse to zoom so that the model fills the window. I suggest you call Kinkos and see if they have SketchUp Pro first before going there. A PDF isn’t going to help you. 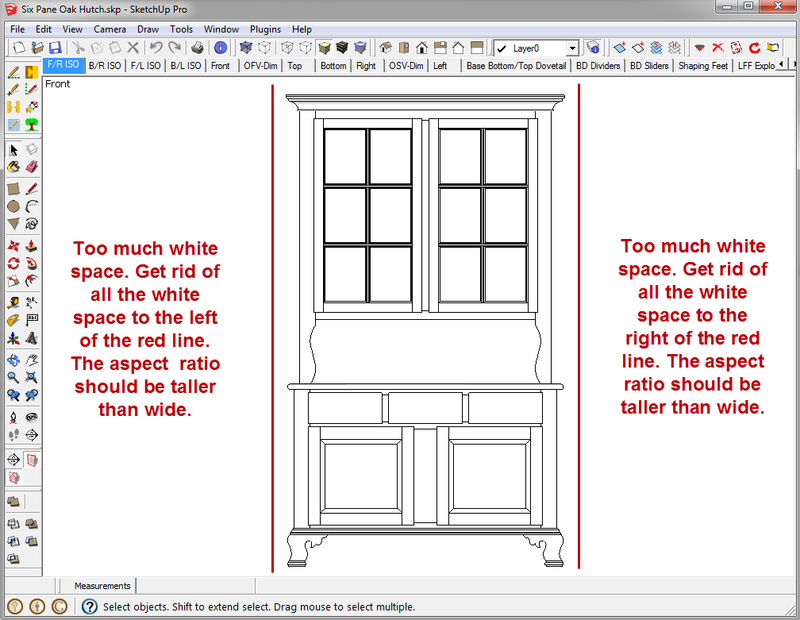 You can’t get a 1:1 scale to follow through from the SketchUp application to a PDF. An alternative is to print 1:1 on your home printer. I will require that you print multiple sheets, many of them blank. But you can put the blank pages back in the printer and tape the non-blank pages together to get a large 1:1. I do this a lot in my shop. The accuracy is more than sufficient. If you use heavier card stock you get a nice stiff template. 2:58 pm, 30 August, 2012 р.
thank you for your comment. i too have the pro version. there is an export function that can export to jpeg in the main menu. I can export 1:1 with that function. Do you any experience with that? 4:11 pm, 30 August, 2012 р.
I don’t have any experience with exporting to a 1:1 jpeg. I am not sure what that means. If you are talking about File/Export/2D Graphic I don’t see how you would get a jpeg that is 1:1 scale. I suppose you could determine the full page size in inches needed to print on paper at 1:1 and then use the pixels per inch the Kinkos printer is set to to determine the overall pixel size of your jpeg. Then you could use the Options tab on the File/Export/2D Graphic dialog box and un-check Use view size to enter the overall pixel size. That might work. 11:13 pm, 5 November, 2012 р. 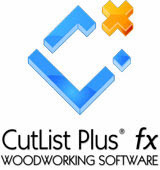 Perhaps you and your readers may be interested in an application called “BigPrint” from Matthias Wandel at his website, woodgears.ca. I’m not sure if you allow web links so if you use the Google search box on the bottom of the front page and type in “bigprint” it will show you the relevant page in a Google search, first entry after the ads. 10:48 am, 6 November, 2012 р.
I usually do not allow links in feedback or or posting comments. Too often spammers are trying to sneak one in that takes people to an undesirable or questionable sight. Or spam commercial ads. But I personally checked this one out and I agree with you; some readers may find this hyperlink useful. 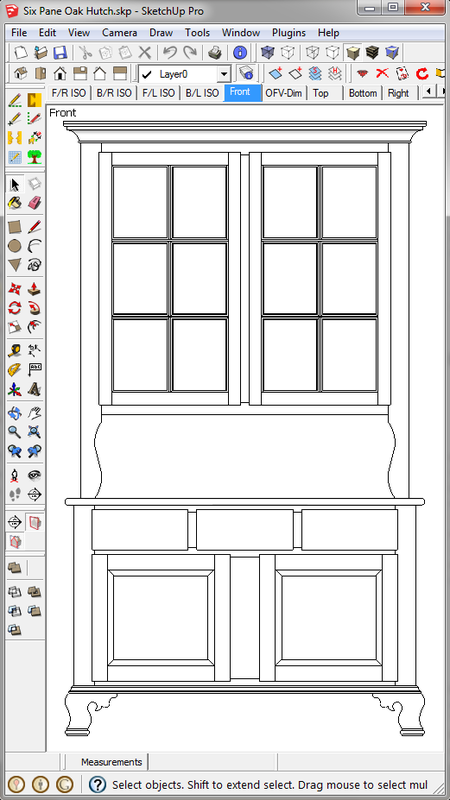 4:58 pm, 11 December, 2012 р.
I’ve had somewhat better luck following your steps but shrinking the actual SketchUp window (not just the margins) on my desktop first. This seems to result in far fewer or no blank pages. Of course shrinking your window will reposition all your tool icons but it’s usually worth it. 9:46 am, 12 December, 2012 р.
I should have mentioned this in my post, but if you use View/Toolbars/Save Toolbar Positions and View/Toolbars/Restore Toolbar Positions you will not have to manually restore them. Sorry for the oversight. 3:16 am, 22 January, 2013 р.
I was wondering if you encountered printing errors when printing to scale? I use 1:1 scale to print out components of my model, however, when it prints, the template is off maybe around 1/32″. Is this an error due to conversion of the model to my printer? 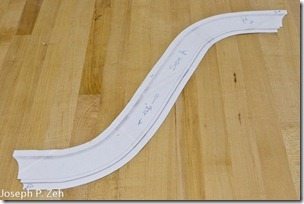 And is there anyway to make the printout with exact measurements? Thanks! 9:02 am, 22 January, 2013 р.
Hmmmmm! I have never had an issue with accuracy of a 1:1 printing of my models; and I do this quite frequently. I have looked at the SketchUp dialog box in some detail to see if there is some control that addresses this and I can’t find one. You may want to run through the calibration procedures for your printer to see if that resolves the problem. Also, use the highest quality of prints to be sure you are using the maximum resolution of your printer and see if that helps. If you wish, send me a copy of your .skp file with a description of which dimension is most off and I will see what results I get on my machine. That should tell us if the model is the problem. 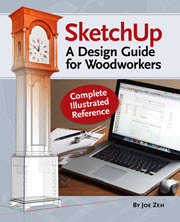 By the way, are you using Version 8 of SketchUp? 2:50 am, 24 January, 2013 р.
Matthias Wandel’s instructions for his BigPrint program mentions that inkjet printers are accurate whereas laser printers tend to have a bit of sizing errors. Matthias’s instruction describe how to adjust the printer settings to get an accurate output from a laser printer. 4:52 am, 1 February, 2013 р. Thanks! Your info worked perfectly–and yours was the only accurate and complete info I found anywhere about resolving this SKP printing problem. 8:12 am, 1 February, 2013 р. Thanks you. I appreciate the comments. I have used printing to scale to produce life size templates for the workshop and it works great. I have been disappointed that in all the years Google owned SketchUp they never fixed the printing problems. I am hopeful that Trimble will.